Any home on or near the lake definitely needs a good deck, so if yours isn’t up to snuff, give us a call so we can help you with that! 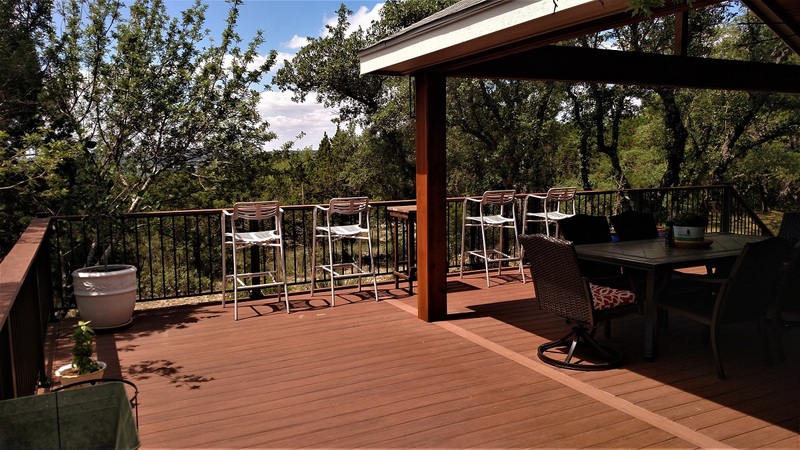 These homeowners near Lake Travis, TX, wanted a new deck designed to be more conducive to entertaining. Their existing deck was spread out over three levels, which might sound good, but they found it wasn’t actually very useful. The various levels and seating areas were just too spread out and not functional as a whole. They also wanted to add some shade! 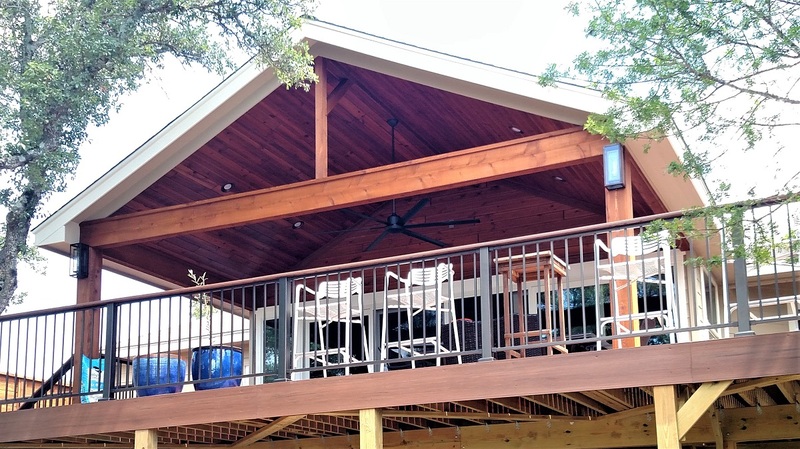 Archadeck of Austin designed a large, new deck that is partially covered with a porch cover for shade and partially open to the big Texas sky. Building it required complete removal of the home’s existing multi-level deck. We used glulam beams to carry the load of the new porch cover and attached the porch roof to the existing hip roof extension. Glulam beams are glue-laminated wood beams that are stronger than steel and perfect for long-span designs. Under the porch cover you can see the gorgeous new Synergy Wood. The clients selected Synergy Wood’s colonial color. 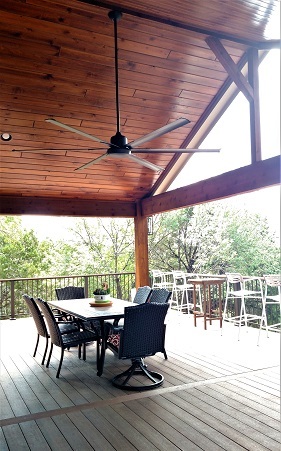 Synergy Wood makes beautiful tongue-and-groove prefinished wood products perfect for a porch ceiling. We used the same Synergy Wood for the ridge wall up in the gable above the sliding glass doors leading into the home. The homeowners plan to install a TV on that wall over the doors. We painted all of the soffit and fascia to match the house exterior. 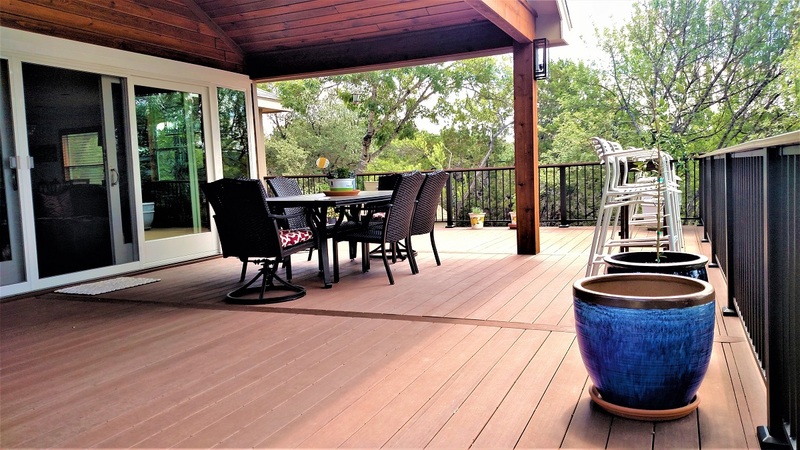 For the decking boards, the clients chose AZEK low-maintenance decking in the mahogany color. We designed the deck in a picture frame pattern with a ribbon board. The beautiful deck railing system features hammered bronze balusters by Fortress and the rail cap is by AZEK. The AZEK rail cap is actually installed over a steel railing. Off to one side you can see the clients’ hot tub. We built a stand so the hot tub can sit at deck level, and we built an attractive privacy screen for it out of a combination of 1×6s and 1×4s. Here’s an additional touch you get with Archadeck of Austin that you don’t get from just any Austin deck builder. 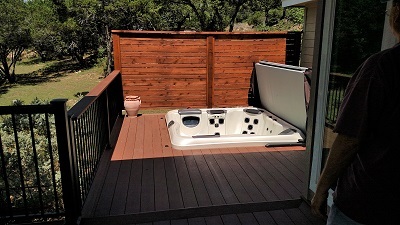 When we install an electrical package like that required for the hot tub, we always check the home’s existing capacity to make sure there’s enough electrical service, either a 150 or 200 amp service panel. 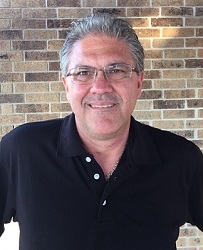 Our competitors often don’t check this and clients then learn after the fact that their electrical panel will not sufficiently service the addition. For this home we needed to replace the service panel inside the home and the main service panel at the pole. We consider this part of a good design for a deck with a hot tub, and we include this service in our quote so there are no surprises. If your current deck is not giving you the satisfaction you deserve, let us design a bigger and better deck for you, too. Contact Archadeck of Austin today at (512) 259-8282 or via email at [email protected] to schedule a free design consultation.